Stocks had been more attractive than bonds with long-term rates so low. But that may be changing. Investors have been pulling money out of stocks that pay high dividends lately and putting it into shares of companies that stand to benefit from the economic recovery. The shift is a significant change from earlier this year when investors were piling into dividend-paying stocks in response to historically low yields in the bond market. But the yield on the 10-year Treasury note recently rose above the average dividend yield paid by companies in the S&P 500 for the first time in just over a year. The 10-year yield hit a high of 2.2% this week, up from an all-time low of 1.4% last July, as investors brace for a slowdown in the Federal Reserve's bond buying campaign. The S&P 500's dividend yield is 1.98%. The rise in bond yields triggered a big move out of defensive sectors of the stock market, which typically include companies that pay high dividends, such as utilities, telecommunications firms and real estate investment trusts. For example, the ETF that tracks utilities, the Utilities Select Sector SPDR Fund (XLU), is down 7% so far this month, while the S&P 500 is on track to gain about 5%. "All of the safe-haven sectors have been underperforming," said David Lutz, head ETF trader at Stifel Nicolaus. "The defensive stocks have been overwhelmed by the rotation away from yield." 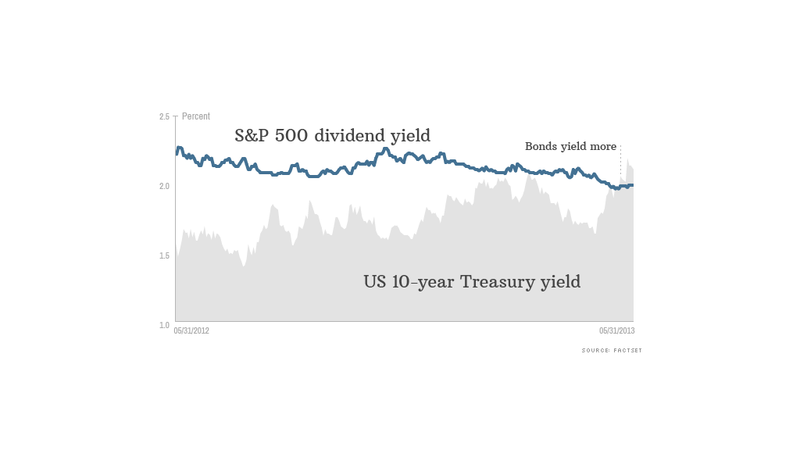 While rising bond yields make dividend stocks less attractive, the shift also reflects investors' increased appetite for risk, said JJ Kinahan, chief derivatives strategist at TD Ameritrade. "Investors had been chasing yield, now they are chasing capital gains," said Kinahan. Related: Is bond bubble losing air? It's the economy. Phil Orlando, chief equity market strategist with Federated Investors, said the move out of dividend stocks suggests that investors are looking forward to a rebound in economic activity during the second half of the year. He said the rally earlier this year was led by defensive stocks because investors were worried that misguided fiscal policies in Washington would hurt the economy. But he said those concerns are beginning to fade and investors are now boosting their exposure to stocks that typically rise along with the economic cycle. 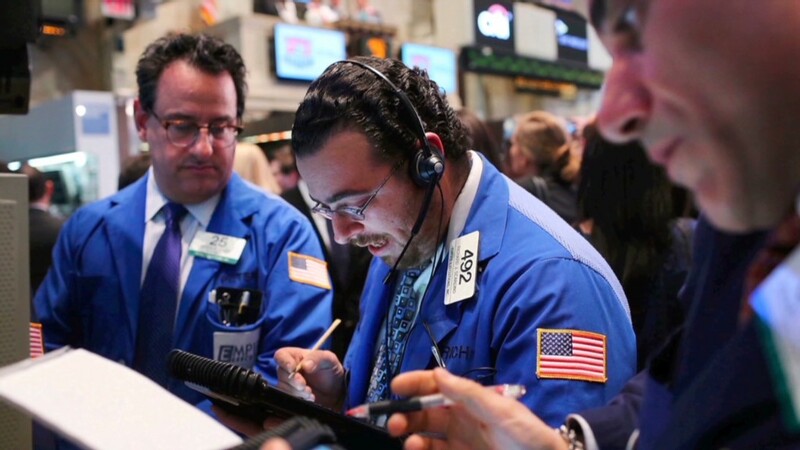 "Investors are beginning to price in an improving economic recovery," said Orlando. "We think that's a trend that that has legs." Orlando pointed to a number of sectors that had been beaten down earlier in the year and are now finding favor as the economy strengthens, including energy, industrials, consumer discretionary and select technology companies. But the financial services sector has been the main beneficiary so far. Banks lead the charge. In the past five trading days, the KBW Bank index (BKX) has risen more than 1%, compared with a gain of about 0.5% for the S&P 500. Shares of Bank of America (BAC) have gained nearly 5% over the past five trading days, hitting a new 52-week high Thursday. Other major banks, such as Citigroup (C), JPMorgan Chase (JPM) and Goldman Sachs (GS), have also hit 52-week highs. Investors are betting that the rise in bond yields will make lending more profitable for banks -- who have been hard pressed to make money on loans in the years since the Federal Reserve cut interest rates to zero. However, higher interest rates could dampen loan volume if consumers and businesses object to paying more to borrow. Lutz said investors are watching the yield curve, which has steepened recently as longer-term Treasury yields rise more than shorter-term yields. This means banks are able borrow money for less in the short term and lend it out for more over the long term. "As the curve steepens, the financials are going to be minting money," said Lutz.